Diese Karte hab ich für den aktuellen Sketch and Stash Challenge gewerkelt. Mein Martha-Stempel ist neu, benutze ich heute zum 1. Mal. Ich find das Motiv so genial *ggggg. This card is for the actual Sketch and Stash Challenge. 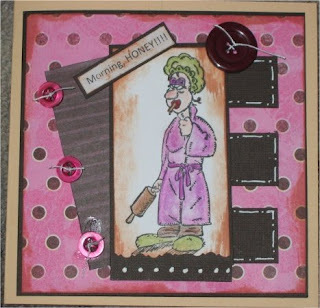 I used my new Martha-Stamp for the 1st time. I just love that funny image*gggg. I love your card Heide, the image is so funny!! Die ist ja cool. Das Motiv ist ja der Hammer.